Where: Lee Meadow, Nr Woolacombe, North Devon. How much: From £12.50 for tent and two adults, Kids up to 12 – £4 per night. Over 12 £5 per night. Further charges for extra tents, cars etc. Campfires: Yes, in previously used fire pits. Facilities: Showers and toilets in permanent block, snack bar and shop in peak season. 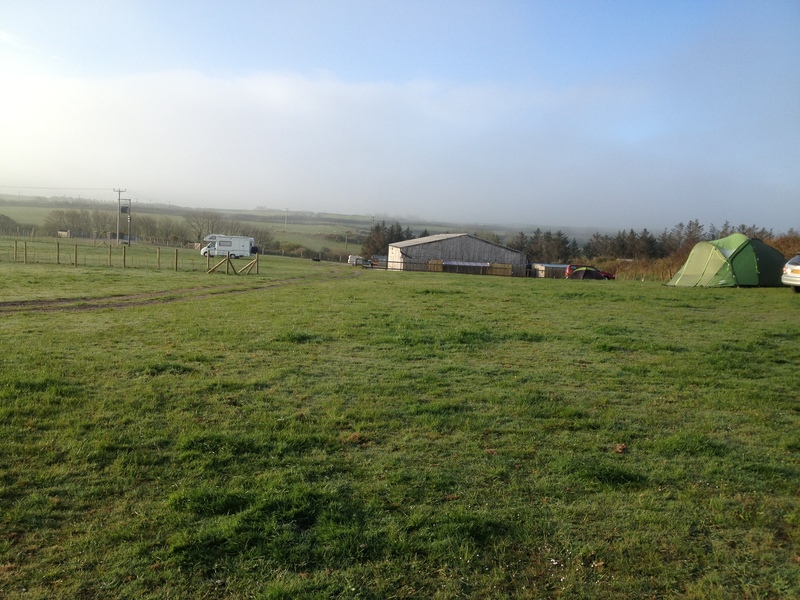 The review: How much you like a place, how positive or negative you feel about it, is always going to be intrinsically linked to how great a time you had there, and for this reason, I wonder if I am best placed to write a review of Lee Meadow Campsite. The fact is that, 25 m.p.h winds and lashing rain on the Friday night, and a murky start on the Saturday morning aside, we had a complete ball here. The winds and rain were, in any event, banished with the help of a chilli and a bottle of red, and the murky Saturday morning cleared, along with the clouds, as the bacon sizzled away. We spent 3 (it was a bank holiday weekend) blissful, sun-filled days on various beaches on the North Devon coast, and ate curry as the sun went down at the wonderful Barricane Beach Cafe – £8 for a plate of curry and rice – beef or chicken, al fresco, with one of the best views in the world (in my humble opinion). We cooked on campfires, we body-boarded, rock pooled, and had a BBQ on the beach. We didn’t want to come home. No wonder, then, that I am going to find it hard to say a bad word about Lee Meadow. I found the site thanks to Hazel (of this blog) when I put out a cry for help on Twitter. I was having real trouble finding a campsite in the Woolacombe area that accepted children and dogs, was open that early in the season and wasn’t a holiday park. It meets her criteria of low key campsite with campfires permitted, and that’s just how we like our camping, too. Booking was very straightforward and the owners (Matt & Trudy, about whom more later) didn’t seem at all fussed or phased by the fact that we would be arriving late-ish on a Friday evening, and simply asked that we let them know how we were getting on during the journey. When we did arrive, just after 8 in the end, Matt was there to greet us. He gave us a quick run-down of the facilities, advised of the best place to pitch in view of the weather, and left us to it. Our camping buddies arrived an hour or so later. 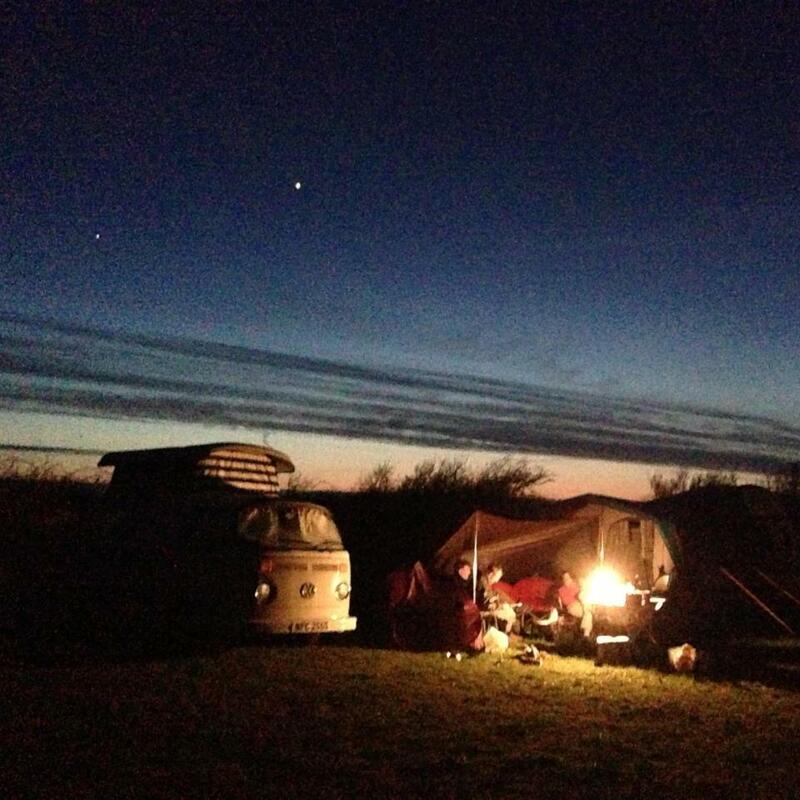 The campsite is just outside Woolacombe, but off the beaten track. Matt & Trudy breed alpacas, and our near neighbours on one side were the male alpacas, who provided something interesting for the kids to run off and look at when we weren’t on the beach. The other side of the camping field were the chickens, who occasionally popped over the hedgerow to say hello, much to the quivering torment of the dogs in our company. According to Matt, it’s been known for campers to wake up to find a chicken laying an egg in their tent. More conventionally, fresh eggs are available from an honesty box at the entrance of the site. The camping area is a large field, with pitches round the edge and a fenced area where a copse of trees is growing, in the middle. As the reviews on the UK Campsite website indicate, there was plenty of space. The pitches weren’t particularly demarcated that I could see. There is a clean loo/shower block by the entrance to the camping field. 3 loos & 3 showers for the ladies, similar for the men. A spacious, covered washing- up area with plenty of room for all your children to engage in the washing up activities. A chemical toilet disposal point and water. Some of the pitches have electric hook up. Campfires are permitted, encouraged, even, in fire pits, and the site owners will supply decent sized bags of decent wood to keep the pyromaniacs in your party happy. Once the wind died down, we had the perfect conditions for chilled out evenings round the fire, and a little light stargazing. There is no playground or anything like that. But there is lots of space, and places to hang out – a fence to sit on, an old tyre, a bench. We had 5 kids between us and they found plenty to do out of nothing – the way kids do best – on the site. If your kids are older, there’s also a track that runs from the campsite that they can go walking on – our eldest kids took the dogs off for walks a couple of times. 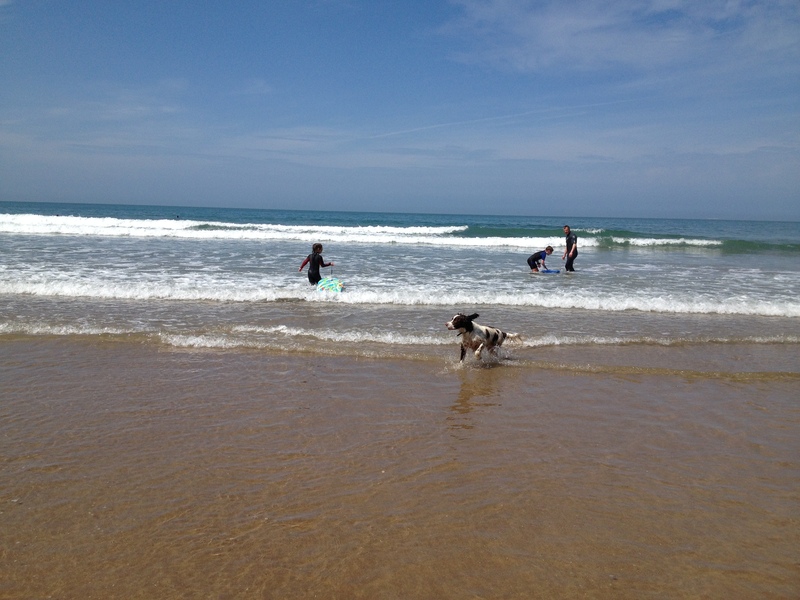 And of course, you are no more than 10 minutes drive from some of the most fantastic coastline and beaches in the area. This is the first year that the site has been open this early in the season. As a result, we shared the site with only a handful of other campers, which added to the sense of it being a special place. The snack bar and shop weren’t open, but we had plenty of bacon, and the relaxed atmosphere of the place more than made up for it. There are, in any event, a couple of well stocked stores in Woolacombe if needed. Matt & Trudy turned up on the Saturday evening to have a chat, collect payment, and generally make sure we were OK. They were pleased to chat, and while we didn’t have any problems, I can imagine that they would be very helpful and anxious to make sure that any issues were resolved quickly. I’ve already said that the site was very quiet. It is in a brilliant location, close to any action that you might be looking for but a relaxed and low key site where you wouldn’t be disturbed. I do wonder if the loos/showers would cope if the site was much busier, but the reviews on UK Campsite suggest that Matt and Trudy work hard to keep everything spotlessly clean. While we were chatting to them, it also became clear that they work hard to make sure that it’s not a rowdy site. People are encouraged to have fires, sit out etc but it’s not a loud music party type of site. Certainly when we were there, it was all great. So there you have it. A site that we’ve added to our 1976 AA book of the coast (which we keep in the camper van) as somewhere we’ll definitely go back to. And thanks, Hazel for the suggestion! Thanks so much Sally! So good to find a low key campsite in an area that has it’s fair share of resort style sites! Great writing and great recipes! 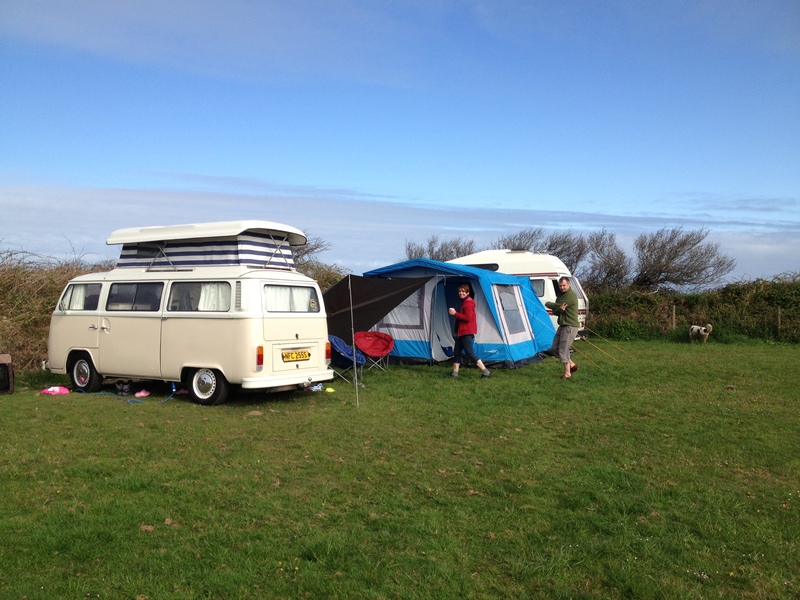 Campsite Review: Caffyns Farm, Lynton, Exmoor. Hope your time at Beeches was good! Welcome to YellowFields, hope you find it useful!